So while I’m not going to “officially” start training for the NYC Marathon until July 1, I’m considering myself “pre-training” right now, which means I already can’t stop thinking about running. Did you read Corey’s post about her relationship with running? It’s like that. Running is my new boyfriend I can’t stop thinking about right now. I’ve loved reading Ali’s posts about working with Coach Cane and how she’s getting personalized feedback on her running speed and performance, and it made me really miss working out with Joel, the trainer who helped me lose 50 pounds and train for my first marathon. I played with the idea of joining a marathon training group before deciding that I wanted to be on my own schedule. I found Marc’s Tumblr a few months back, presumably through someone else I followed. While I wanted some personalized attention to help me meet my running goals, now’s not really the best time for me to shell out a few hundred bucks to do so. As I thought about running coaches and putting together my marathon training plan, Marc’s name stuck in the back of my head. When I read about Emily and Jen talking about their running coaches, I was curious how they picked them. In my typical stubborn way, I decided to figure out the process on my own rather than ask. I realized that a “virtual” coach (that is, someone you don’t meet with in person) is probably cheaper than someone you have face-to-face interaction with, so I started searching for “personal running coach online.” At this point, the results looked a bit better, but it was still overwhelming to consider working with these coaches I’d never heard of. At this point, if I hadn’t heard of Marc, I probably would have started asking around for recommendations. what were his credentials? He’s a high school track coach and has a number of his own very impressive personal records. That’s really about it for me, but if there’s something about your running that you’re very particular about (running philosophy, number of times per week), make sure the coach you decide to work with has running values aligned with yours. Marathon: 4:30. I know this one is super-ambitious, to take 29 minutes off my marathon, but I think that in better conditions than Chicago, this is possible with lots of hard work. June 20th 2011 Posted under Fitness. Tagged: marathon training, running, running coaching by Theodora Blanchfield. I love this! I want a running coach, but I also want to be in control of certain aspects of my training. I look forward to following your training. Oh and I too thought maybe, just maybe I could hire Ali’s coach. But he’s out of my budget also. @Fit Chick in the City: At least for me, this seems like a good balance of having a say in parts of my training and leaving what I don’t know (most of it) to someone who does. I know? Isn’t the five minutes when you think just maybe you can work with Ali’s coach exciting? Right before you’re brought back to reality. So awesome that you are taking the steps to kick up your running! This is awesome! I am so excited to follow your progress! You are so funny! Why didn’t you just ask?!?! I def lucked out with my running coach as my old FL running group happen to have two certified coaches on staff that coach the team for free just because that’s what they love to do. I’m actually in the process of finding one more local now that I’m all settled here in Michigan and the first place I went to look is on the RRCA website: http://www.rrca.org/ To find coaches in and around the Mid-Michigan area. My next step is googling the different coaches and seeing what people had to say. Having a coach is hands down the #1 best way to get the most out of your training and you don’t have to be an elite to enlist one. Most running stores and/or local run clubs have coaches on staff that will work with you or you can google search your own. If they are a good coach they will work with your availability to train, focus on your weaknesses, and help you build towards that PR you’re shooting for. Good luck with Marc, I am so excited to see what he does for you and for your running! @Morgan: I have no idea why I didn’t ask, now that I think about it 🙂 Maybe I thought it was some secret knowledge you got once you busted out a sub-8:00 mile in a race, or something like that. So great! I have a similar arrangement — I’m lucky enough that one of my best friends from college is an athlete (she’s training for a half-ironman right now…oof) and does this for me for free (although I keep promising to pay her in cocktails and cupcakes), but having someone who is invested in your training plan and tailors workouts makes it that much more motivating to reach your goals. Good luck!! i’m in the pre-training right now too and can’t get running off my mind (i hope it lasts, haha). running with a coach sounds awesome. my first step is to run with a group. preferably consisting of better, stronger, more experienced runners than me. just found one that fits the bill and we’ll see how it goes. those are awesome goals. i’ve been chasing the allusive sub-2:00 half-marathon for a bit. i feel that this is my year though. So awesome Theodora! You will definitely hit your goals once you are on a concrete training plan. 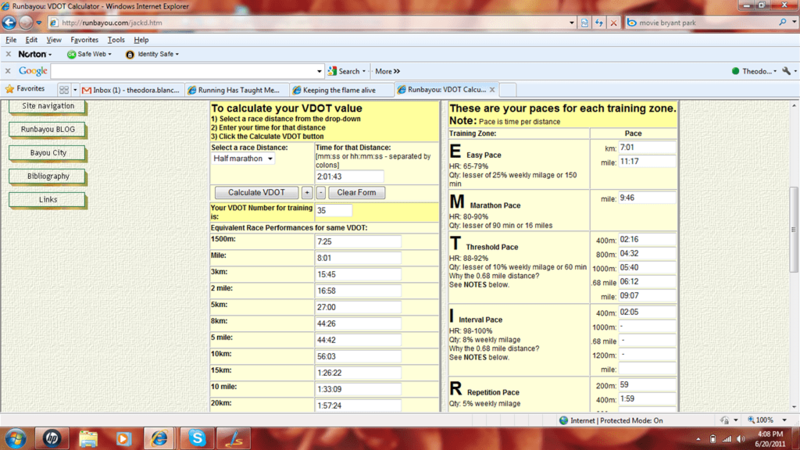 While I was a coach to my group of friends for my last half marathon (using a random but perfect-for-me training plan that I found online) I found huge results just by sticking to the plan and using a calculator similar to the VDOT. I’m now trying out CrossFit Endurance with my CrossFit Coaches. It’s pretty controversial but I’m hoping it works for me because logging long hours/ too much mileage makes my iliotibial band syndrome flair up. Good luck, I’m really looking forward to reading your updates! Love this post! I started my training for the Chicago Marathon today and I frequently refer to running as my boyfriend too! Love your blog and can’t wait to follow your training. Hahah it’s good to know that someone else is consumed with the NY marathon before training even starts! This is a great post and it’s so tempting to hire him now that I know how reasonable the rate is! I always assumed something like this was completely out of my budget! So funny– I went to school and ran with Marc at Villanova. Definitely a good guy (and great runner! ), and sounds like he’ll do a great job at customizing your training plan. That’s great! Unfortunately even the $40 is out of budget for me. I am trying to think outside the box on this one because I also would like a personalized plan. Does Marc’s plan include crosstraining for you? This is awesome! I’m getting a little help training for Chicago this year and have a lot of similar goals to yours, so I’m excited to follow your training! A running coach! That’s so exciting!!! I would love to try that!!!!!! !